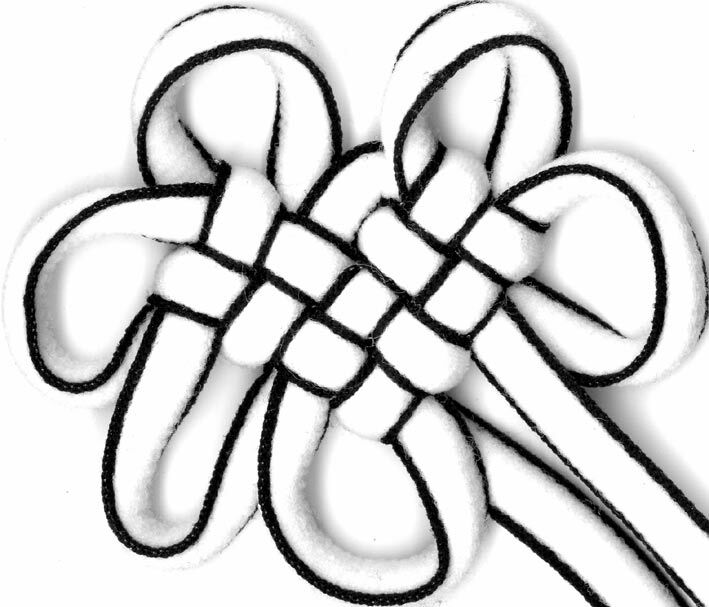 While the flower knot, when considered as a polygonal knot, is a family unto itself with many (many!) 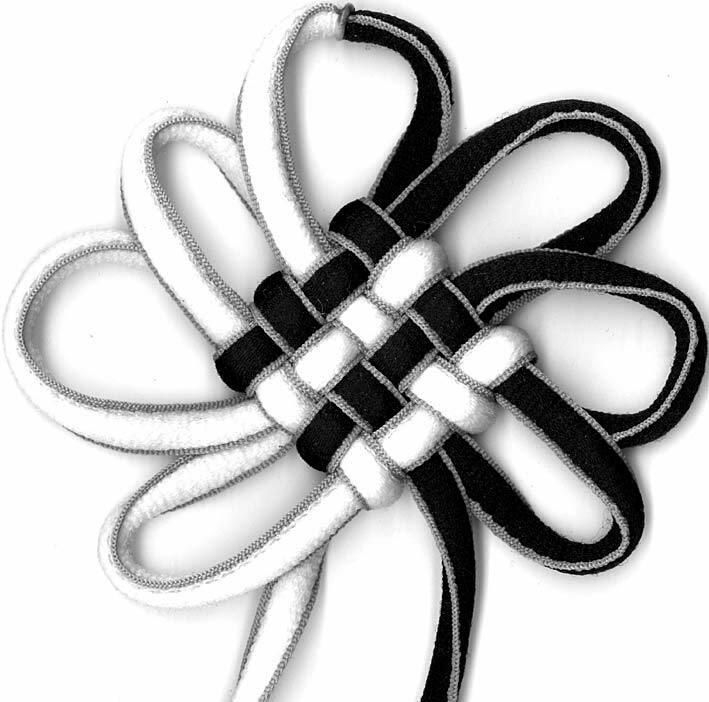 variations starting with the number of petals (ears) and the ways that the structural loops interlace, the basic square flower knot is also the basic unit of the mystic knot (see right). Now flower knots can be chained together via their ears as in the case of the ru-yi knot, but if you instead extend the structural loops and weave through them appropriately, you begin to build up a mystic knot. By extending the horizontal structural loops and weaving one extra loop from the top and one from the bottom, you've created a knot with 2 square flower knots (let's call this the mystic unit, shall we?) side by side. I tend to call this the 2x1 mystic knot (see left). Since it's a knot that you can pick up and rotate at will, there's no difference between a 2x1 and a 1x2 knot although if you were making clockwise versus counterclockwise mystic units... aigh!! I'll think about that later. In any case, you cannot put CW and CCW mystic units together in a 2x1 knot and have a stable knot (although, maybe if you sideline it in a non-standard way...!?). What was I talking about? Oh, right... If you then extend the structural loops on one side vertically and weave through that in turn you get a little 'L' shaped mystic knot composed of 3 mystic units (see right). 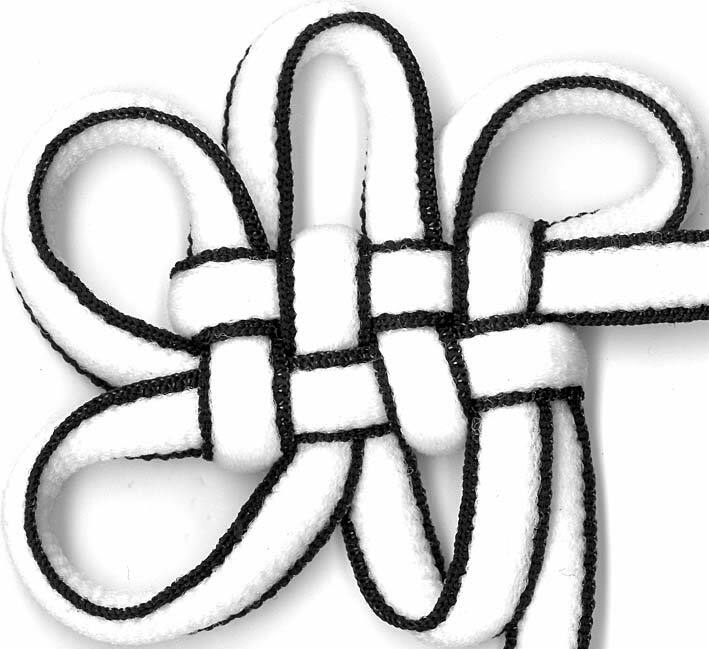 And if you turn that knot 45° then it looks like a heart (or a 'V', see left). But maybe it helps the heart idea if it's red and pink. So, if you extend all the structural loops then you get the classic (2x2) mystic knot (see right). Now, imagine making a design on graph paper. Any solid shape can be made using mystic units. I have seen a mystic knot version of the map of Taiwan. Further, designs with holes can also be made, although sometimes the pathfinding can be a bit tricky and cords might need to travel through the hollow space inside the knot to help out. A mathematician who studies tiling or maybe path finding should be able to help us out with limits and parameters. 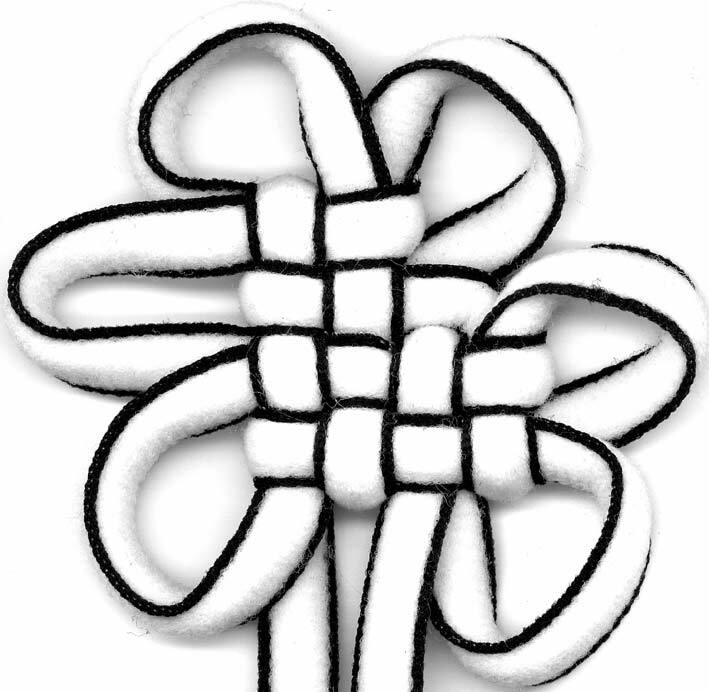 Speaking of the hollow space inside the knot, the mystic knot, in weaving terms is a double woven pocket. Now someone who weaves can probably correct me if I'm wrong here (please do!). Double weave is made on a single loom woven in such a way that 2 layers of cloth are generated (sometimes occasionally interconnected, but for our purposes, not. At least not except at the edges). If the weave is connected only on one side, you get a double-wide piece of cloth (unless you cut it to get 2 separate layers of cloth). If the weave is connected on 2 sides, you get a tube of cloth. If the weave is connected on 3 sides you get a pocket. If the weave is connected on 4 sides you get a closed pocket. 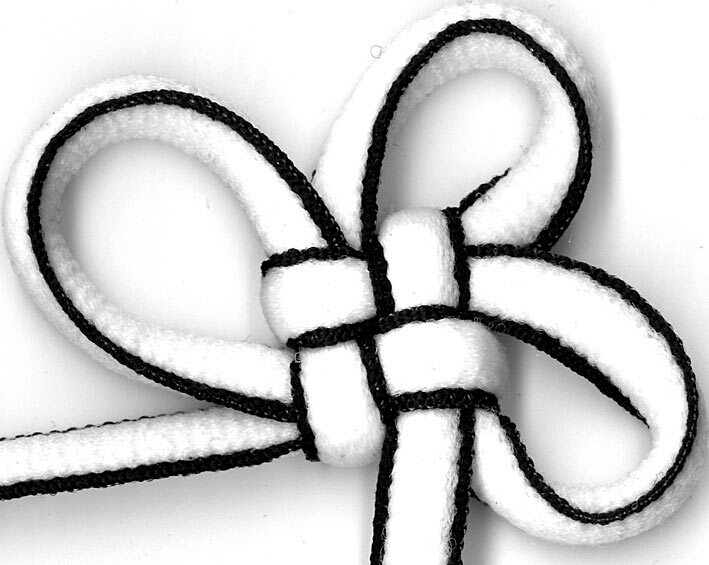 The mystic knot is a closed pocket. Compared to most fabric, however, it is a very large scale thing and it is very easy to open a gap into which things can be put and then reseal the pocket. I've seen projects where a mystic knot is turned into a potpourri or moth repellent sachet by stuffing the pocket with the appropriate substance.